This week: Nicholas Bustamante, professor of art at Louisiana Tech, and Derek Poole, who is working as Prof. Bustamante's studio assistant this summer. Nicholas Bustamante's work will be featured in a show opening August 4th at the Arender Gallery in Monroe. This is Q&Art. 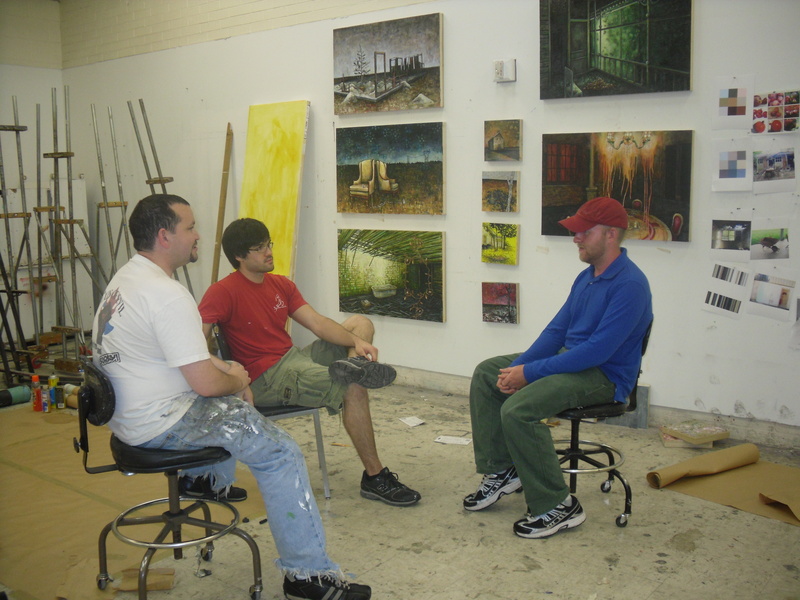 I'm Russell Pirkle, and today I'm interviewing Nicholas Bustamante, professor of art at Louisiana Tech, along with his studio assistant Derek Poole. Let's start with some questions about you, Professor Bustamante, and then we'll move on to your work this summer and your experiences with Derek. When and how did you first decide you wanted to be an artist? It wasn't until I was in undergrad. I had very little experience with art until then, and it just kind of opened up my world. It was the first museum I ever went to was on a school field trip. First time actually doing something that I consider art that's not just arts and crafts was as an undergrad. And honestly I just took it because I didn't know what else to take and just found that I was good at it. And I loved doing it. So did you not start out in the art program at your school? What was your work like when you first started, and how has it changed since? It changed a lot. I started purely abstract as an undergrad student. Absolutely no recognizable imagery. In fact, my senior year as an undergrad, I was doing these very large abstract paintings where I wasn't even using paint brushes. I was just using palette knives and oil sticks. They're huge, they're kind of macho. There's a lot of energy to them. But it wasn't until I went to grad school that I really started to develop the conceptual end to my work. And I found that the narrative became more important. Really, that's what was driving the work, so by bringing in more recognizable imagery, it allowed me to create that more complex narrative, and stay true to what was fueling the things to begin with. Honestly, it was during grad school when during a critique, the professor said 'well that's great that you have all these ideas, but when I look at this, I just see a bunch of scribbles and paint. It doesn't make sense. If that's what is so important, you're not communicating that at all.' So he kind of called me out on my stuff. That's when it started to shift. Do you have any thoughts about the potentials and limitations of art and painting to convey a narrative that may not be there in other forms of expression such as writing or music? That's a really good question. I feel like we're kind of at a disadvantage. You put a painting against a two hour film, and it's like how do you compete with this instant gratification, bombardment of imagery. I think us as a culture, it's in us that quick fast pace. Painting is a very very slow process, as far as the interaction between the viewer and the piece itself. In all honesty, I think that moment of reflection, that moment of quietness that a painting or art can give to the viewer, that's something that is lacking or missing in our day to day actions and interactions with imagery, as far as tv, internet or even cinema. It slows you down. It gives you time to reflect. At least with my work, I try to cash in on that. I try to not give the viewer the entire narrative. I want them to put themselves in the piece and reflect on their own experience, fill in that gap. So it requires a lot more than just a pretty thing on a wall. Could you tell me about some of the themes and subjects you deal with in your work? Sure. It's hard when you meet somebody for the first time, and they say 'what kind of work do you do?' Where the heck do you start? So I would say it's about protection and captivity. Terror and safety. Love and sorrow. In one word, it's about memory. The way that memory really, and I use this term loosely, haunts us. It influences the decisions that we make. It's something that shapes who we are today, but even besides its shaping who we are, it's always there on your shoulder and the back of your mind influencing you, in what you do or how you interact with people. Or whatever. The work that I started on in grad school started to be based on architectural structures, and I was interested in this idea of the structure becoming a metaphor for the home. And I was interested in the way, and I brought this up in the show at Turbo Goat, there's all this modern day folklore about ghosts, ghost houses, and hauntings. It's a story that a lot of people are interested in. And for me that's kind of a poetic expression of how we're all haunted by memories. These places aren't necessarily haunted. It's us that are haunted. And by making these really out there movies, by pushing it to that extreme, it's safely contained. It's something that, if that's what a haunting looks like, then obviously I'm not haunted. So that's how I use the structures in the pieces. Why do you think these themes are especially important to you? I don't know. That's a good question. To be completely honest with you, the reason for me that they're so important, is that in high school, I was in a pretty bad car accident, and I lost a lot of my memory. So a lot of memory that I have now of growing up is from photos, and it's from it being told to me through imagery. So I have this really strange disconnect. So images, especially of past events in my life that I don't remember first hand, have a different kind of significance for me. So obviously that's an underlining thing that got me thinking about this and exploring this. Could you tell me about what about oil painting appeals to you and how you feel it connects to the subject matter of your work? Well, my paintings have a lot of layers, and I'm obsessed with the surface quality, almost to a fault. It just takes me forever to do paintings. I like the way that it starts to create history with the work. These places that I go out and I shoot, these abandoned houses, have this evidence of time passing. So that kind of carries through to the work that I'm doing in here, even though they're not all homes. The idea of that residue, building up thick layers then thin layers of the paint. Also, it goes on to very basic philosophy about painting. I think that paintings need to work from a distance as well as up close. And the rich surface quality rewards the viewer when they get close as well. It's that surface that I've really fallen in love with and drool over in the pieces. Shifting gears here a little, is there anything you can tell me about your philosophy of teaching? What works in your experience? Expect a lot from the students. If you set the bar too low, then sometimes it leads the students to not push themselves. And I think that's really the biggest thing. Just expect a lot out of them. Make sure they understand. For art students in particular, this isn't necessarily always going to be fun. That they understand the sacrifices that need to happen to make it. And the other part of the teaching philosophy is to help them find their own voice. I think that's really important. Not everybody follows that, but it's like, I want to teach them the skills to get where they want to go, but I don't want to create a bunch of Nicholas Bustamantes. That's the last thing I want to do. I want them to have their own voice and help them develop that, what their passion is. That's what's going to help carry through them. It's going to beat the stats of being one out of ten people that practice art after they graduate. It's what's going to keep them going, that personal connection. Oh man. Studio assistants. Haha. No, just having that open dialogue, always being around art, and talking about art. Being able to share that with somebody. Being able to problem solve. Through teaching, I've become a better artist. Because, in an advanced painting class, or a beginning drawing class, I'm problem solving twenty pieces. So it's working that muscle. It's getting me to really be critical and to see things from a different point of view. And I think that always helps me push my own body of work as well. Tell me about the pieces that you're working on now. It's again talking about memory. The big difference with the stuff this summer is that I'm using more chairs and furniture as stand ins for the people, rather than just actual empty spaces. So I'm really looking at them, and when I talked to Derek in the studio about laying these out, and what to come up with, I really talk about the chairs having body language as if they're people, and how they're interacting. We're exploring a new vocabulary of symbols. I'm bringing in these paper cup telephones and talking about communication. These bathtubs that for me symbolize, in a way they're talking about a baptismal, this idea of cleaning and purity and rebirth and birth. Another big thing that we talked about when we came in here that I wanted to do was to really push the light, starting to use the light in the paintings as a symbol itself. So, I think that's starting to actually happen in the pieces. Derek, what part do you play in the creation of these works? At first, I was doing underpaintings for the works. I started doing the underpaintings in acrylic, but lately I've been using oil. Professor Bustamante, what about Derek made him especially suited to work with you? Well, I've had a variety of studio assistants in the past. I would say Derek is the most talented as far as a painter goes. And what I look for in a studio assistant is somebody that's going to take it seriously. In exchange for all the time he puts in, he gets a piece that we work on at the end of the summer, and that's it. I don't pay him hourly or anything. And he's been in here almost everyday. Sometimes I have to just kick him out. I'm like I'm done I gotta go. It's always interesting because as an artist yourself, art is very solitairy, you do it by yourself. And to have someone in the mix, always at first it's difficult to get used to that. When Derek came in, that first week we were very slowly working, and I was trying to get used to having someone else in the studio. And you try to get used to working on somebody else's work. And now we're just rocking and rolling. I'll start a piece, and he understands over this last month, the process of the painting and how I lay things out, and the palette knife work and all that stuff. So besides laying out the underlying painting for me after I come up with the composition, I feel very confident to hand over a painting and say 'this area needs to be glazed. This needs to be reinforced. This is where I want the light source to come from, the kind of texture i want, and just letting him go. So it's awesome to have somebody in here like that that I could really trust with the work. And Derek, what made you want to assume the position of Bustamante's studio assistant? Well, I had a friend of mine told me that Bustamante needed someone. And so I was kind of interested, because I'd had a few classes with Nick, and he's had a big impact on me as far as understanding painting and color and composition, and really conceptually as well. So I felt like it was a good opportunity to learn and to paint. Being able to come up here and paint. And you know, what else would I be doing during the summer. Aside from lightening the workload, what other advantages have you found to having a studio assistant? To break up the monotony of the day. Because it is so friggin' hard to maintain a studio practice every single day. I get here at seven-thirty in the morning. I leave at five. Sometimes I'll break for lunch and go home for a half hour. But a lot of times we just eat sandwiches in here. So besides him helping me with the workload, having someone else in here, somebody to take a break with and watch crappy youtube videos for five minutes, or to have a conversation with. That's kind of more of a personal thing, but I really lean on Derek a lot when it comes to, once I start to polish up some of these paintings, what needs to happen in it. We bounce ideas off one another. At times I feel like some of these are more a collaboration than just my . . . Of course it's my idea, but once we start getting going, his voice is very much heard. How do you think these pieces would be different if Derek weren't here? Well, I know for a fact I would have at least ruined one of these pieces. I have a tendency especially when I start off painting in the summer of overworking things and not wanting to call things done. If they're not done, then there's always that possibility of them getting better. That piece, the two chairs in the middle over there, I was convinced that was too open. I needed to bombard it with a bunch more crap. That was one of those times when Derek's like 'no, just leave it. Let it chill for a while. It's almost like a teacher-student reversal, you know. So I think there's a sense of a little bit more of a quietness to some of the pieces, and I think that's been a really big influence of having Derek in the studio. And Derek, what have you learned from your experience as Nick's studio assistant? You know, I always wondered how Nick was able to get the surface and build up all these layers. That's always intrigued me looking at his paintings, because I was always kind of blown away. So, I got to learn a lot about his process and his work with layers. Really, I've just gotten to experience that and understand about the evolution of each piece. And also, I guess it's more mondane, but I've gotten to work with the brushes more. I paint a lot looser, and Nick's paintings are a lot tighter, so I feel like it's been a good experience. I feel like it's almost like the opposite of what I would do. Well that's all the time I have. Thanks so much for speaking with me.